There are a lot of swimsuits that don't offer adequate comfort and support in the breast area. If you go swimming a lot and the breast area of your swimsuit makes you uncomfortable, you can look into adding your own bra cups to the suit. It is actually really easy to do. The larger your breast size, the more difficult it is to find cups that will fit, but if you search long enough, you will surely find the items you need. Go to your local fabric/craft store and buy foam bra cups that will fit your bust size. They come in normal bra cup sizes and they usually come in white or skin tone. You want to find a seamless, lightweight and water resistant pair that will blend in with your swimsuit. You should also look for a pair that are molded for comfort. Place the cups in the breast area of the swimsuit. Make sure they fit perfectly into the area and they aren't showing out threw the sides. This could make for an unattractive swimsuit. You want to make sure that your swimsuit is covering the entire cup. Put on your swimsuit and place the cups inside of it. Position them so they are perfectly fit and completely covered by the swimsuit. Use pins to secure the cups in place and then carefully take the swimsuit off. Sew the cups into place by starting at the bottom of the cup edge and going around the edges. 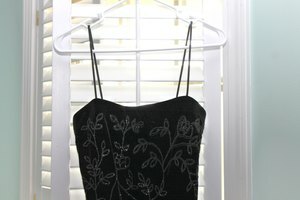 If you don't have a sewing machine, you can do this by hand.